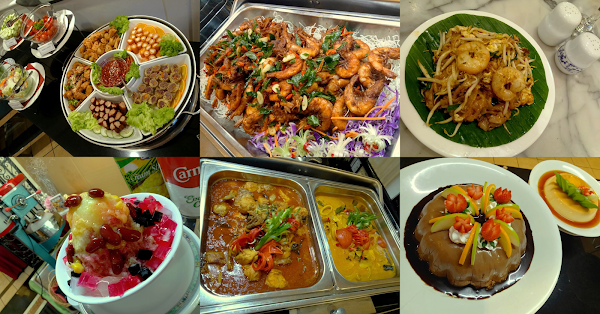 Located at the Lobby Level, Kopi Tiam serves as the main eatery of Bayview Hotel Georgetown Penang. The restaurant presents a family-friendly dining atmosphere. 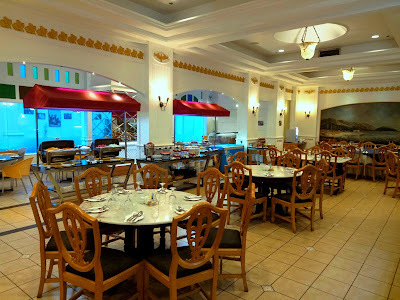 Today's visit is to review to the hotel's Sunday Super Saver Brunch, which is served in buffet style. 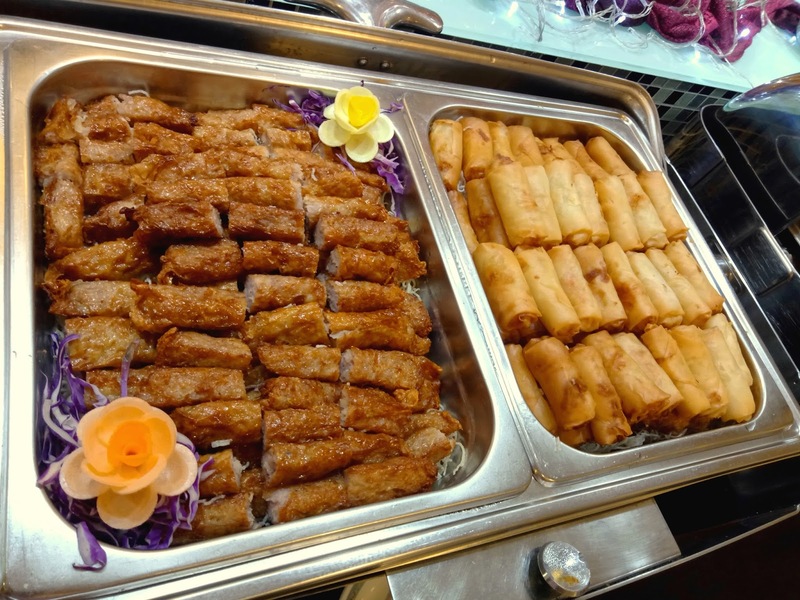 Starting with appetizers, the Chinese Cold Platter features a variety of deep-fried snacks like sesame chicken (芝麻鸡), chicken lobak (五香鸡肉卷), Vietnamese spring rolls (chả giò), crab sticks and money bags (福袋). Chili sauce is provided. 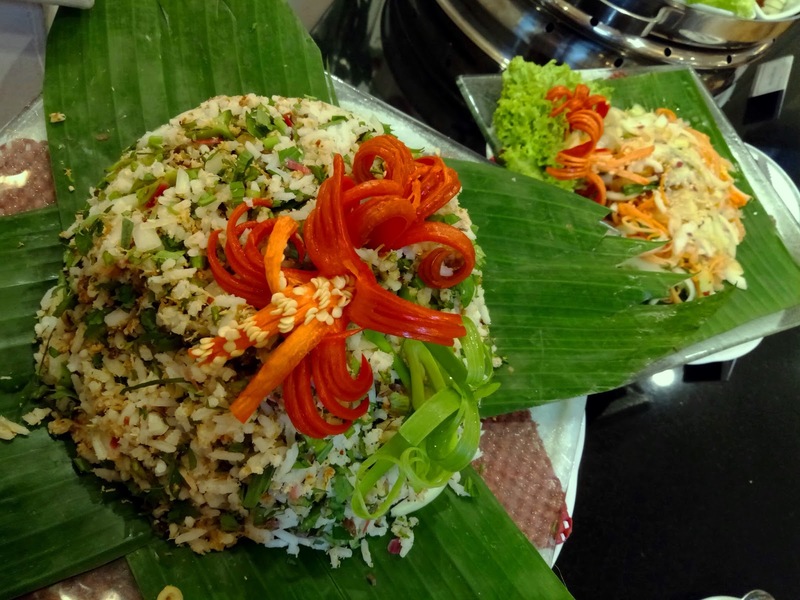 Meanwhile, Nasi Ulam is a nourishing Malay rice dish which contains raw vegetables like turmeric leaves, peppermint and onions. The herbal aroma of the vegetables is appealing indeed. Also served today is Thai Papaya Salad (ส้มตำ). 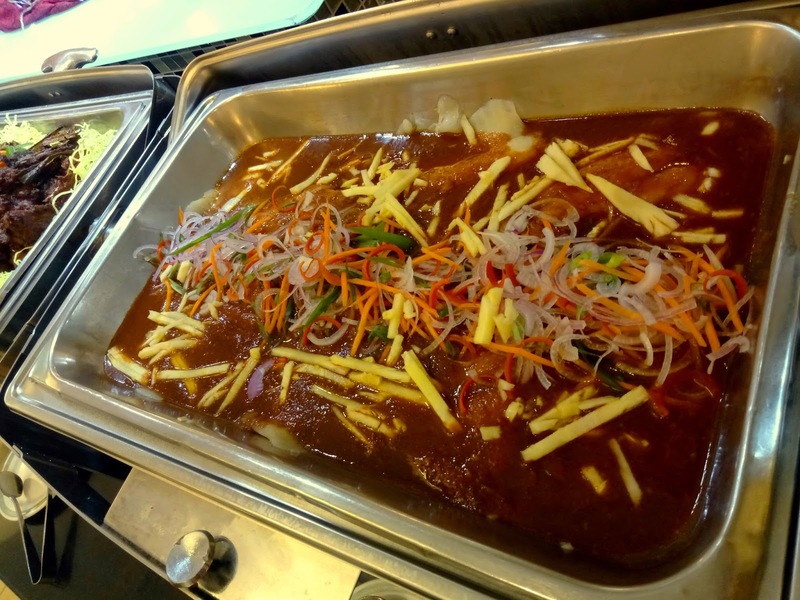 The buffet features several live action stalls, one of which prepares Popiah Basah. This popular hawker food consists of shredded jicama that is wrapped in soft dough skin. Also included in the rolls are tofu, minced chicken, crab sticks, fried shallots and scallions. 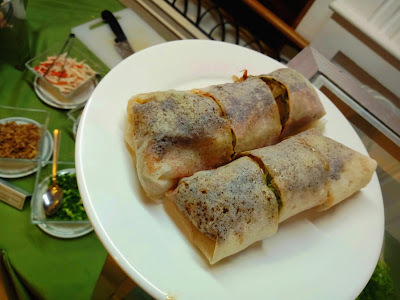 Sweet sauce and chili sauce serve to enhance the popiah's flavor. Char Koay Teow (炒粿条) is one of Penang's most iconic dishes. Flat rice noodle is stir-fried with shrimps, egg, bean sprouts and garlic chives to a toasty aroma. 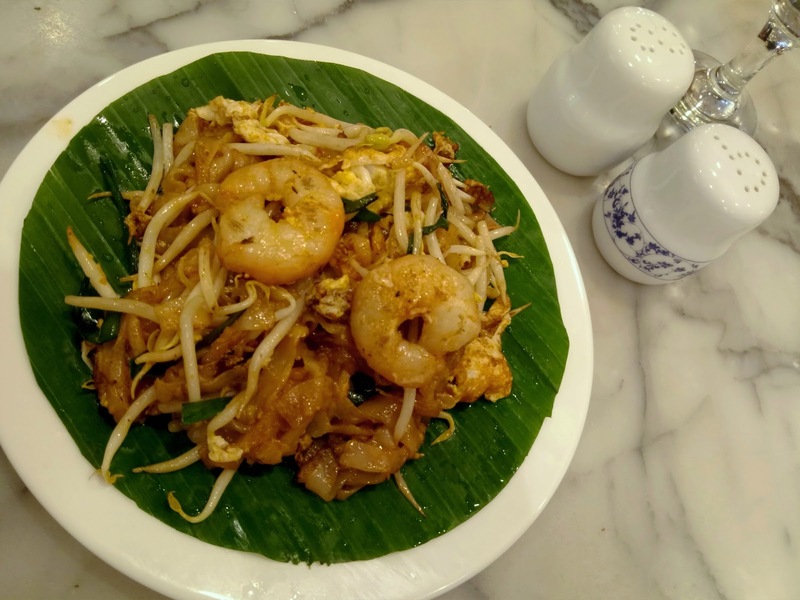 Char Koay Teow is best enjoyed while it is piping hot from the wok. Laksa Kahwin is a unique creation by Chef Tony. 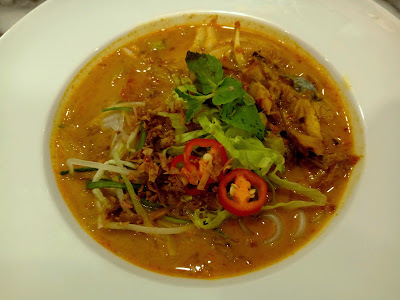 The noodle dish is a marriage between local Penang laksa and laksa lemak ("kahwin" in Malay means "marriage"). Although there is a subtle sourness from tamarind, the main taste comes from rich coconut milk. 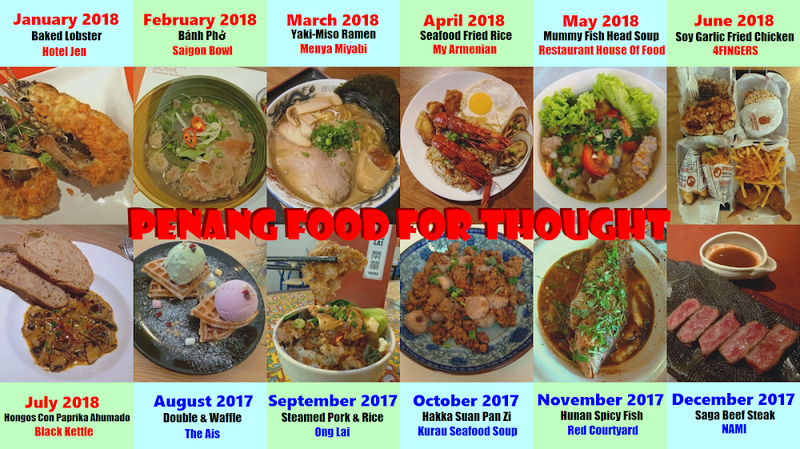 Laksa Kahwin is highly recommended but it is not available every week. Call the restaurant in advance if you wish to catch this delectable dish. 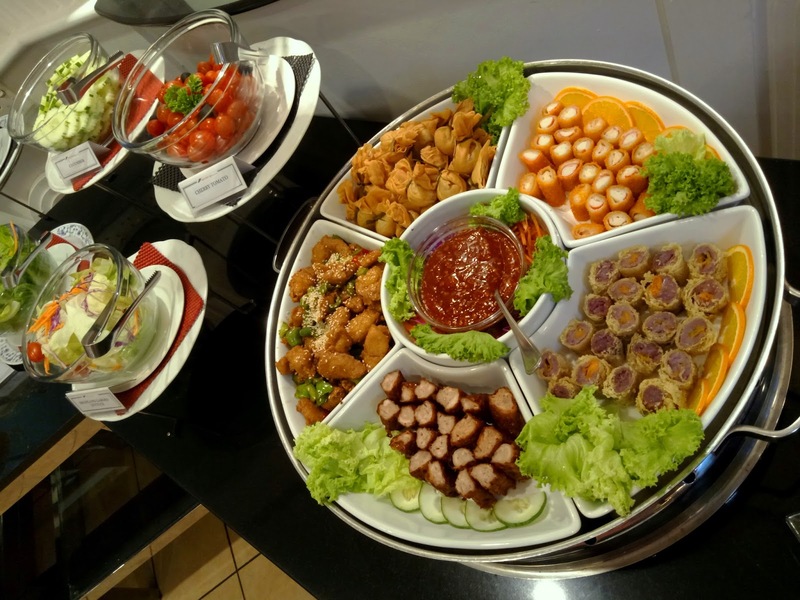 The buffet also includes a variety of hot dishes. Most of them are local recipes that Malaysian are familiar with. For instance, Chicken Curry Kapitan is an iconic Peranakan (Nyonya) recipe which uses lots of fiery spices. 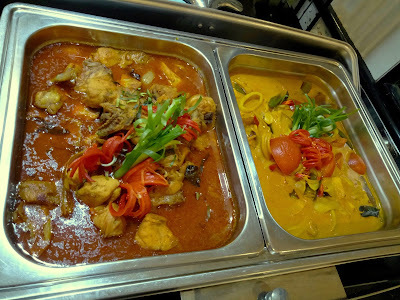 Meanwhile, Gulai Sotong Lemak features a yellowish gravy that is cooked from coconut milk and turmeric (kunyit). The curry also contains squid, okra (lady's fingers) and pineapple chunks. Another notable highlight today is Steamed Fish, which is seasoned with thick ulam sauce. The chef's choice of fish is tilapia. I enjoy this dish very much because the sweet, sour and spicy flavors work together in perfect harmony. Next, Ayam Goreng Serai is fried chicken coated with a special spice mix that consists of lemongrass, onion, ginger and turmeric. Despite the charred surface, the chicken remains quite tender. Deep-Fried Prawns are coated with salted egg paste. I prefer the taste of salted egg to take a more prominent role. 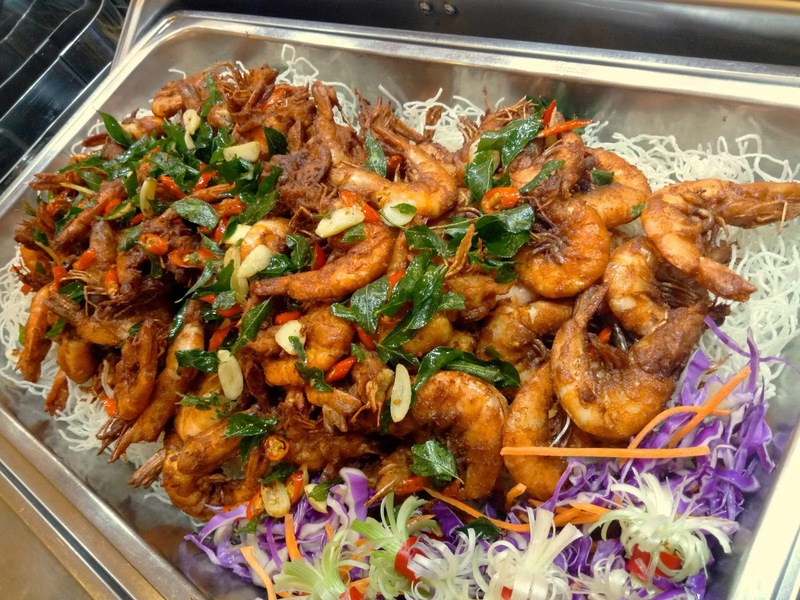 The shrimps are garnished with curry leaves, red chili peppers and garlic, resulting in a colorful presentation. Moving on, Chicken Lobak contains minced chicken seasoned with five-spice powder (五香粉). Wrapped in tofu skin (腐皮), the rolls are deep-fried so that they become crispy. Besides Chicken Lobak, Spring Rolls are available too. Fried Chai Tar comprises of seafood tofu (海鲜豆腐), broccoli, baby corn, button mushrooms and wood ear fungus (黑木耳). After a string of meaty dishes, it is nice to have some vegetables for a change. 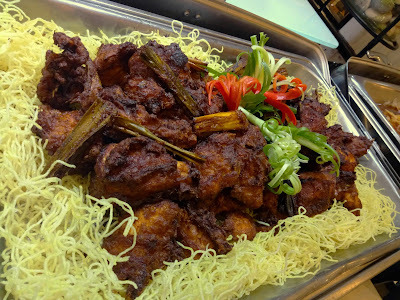 Kopi Tiam's buffet includes several Western dishes such as pizzas and pasta. 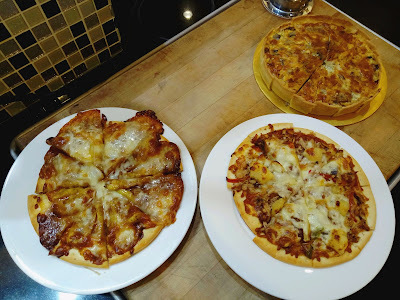 Pizza choices are Hawaiian Pizza, Banana Pizza and Spinach & Mushroom Pizza. I think the Banana Pizza is special indeed. As for pasta, Spaghetti Napolitana is served today. I am also attracted by the handful of Western pastries. Prepared today are Carrot Cake, Chocolate Brownies and Mango Tarts. 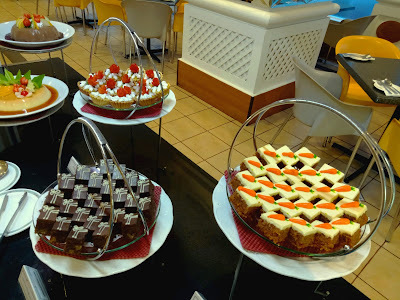 I am particularly fascinated by the Mango Tarts. Between the mango-flavored custard and pastry crust is a layer of chocolate sauce. 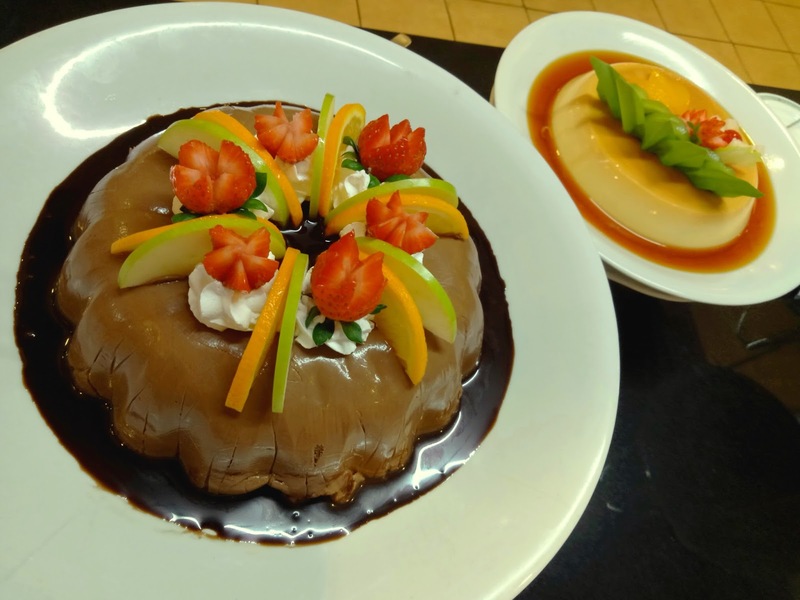 Other desserts that are prepared this evening are Chocolate Mousse and Crème Caramel. The Chocolate Mousse is sweet in a non-surfeiting way. It is perfect for people who appreciate the bitter aftertaste of cocoa. 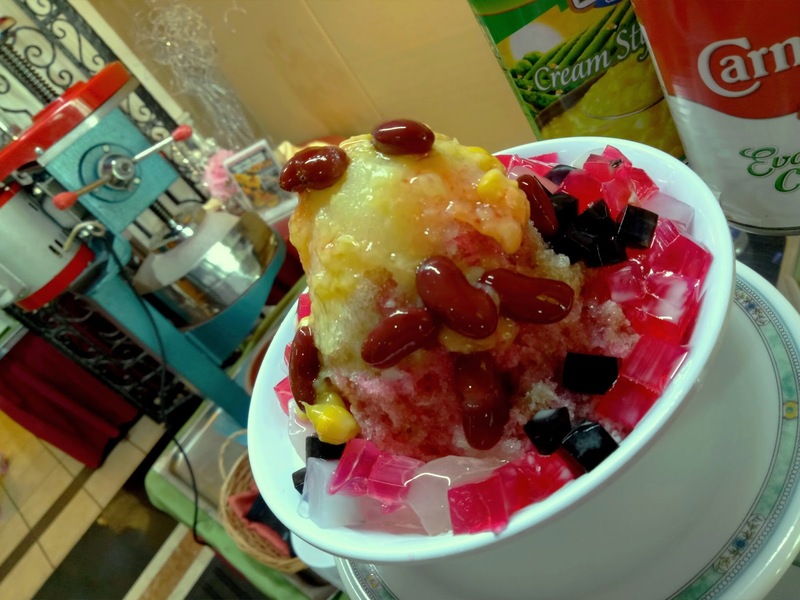 Ice Kacang is generally regarded as Malaysia's favorite dessert. The heap of shaved ice is flavored with gula melaka (palm sugar), sirap ros (rose syrup) and evaporated milk. 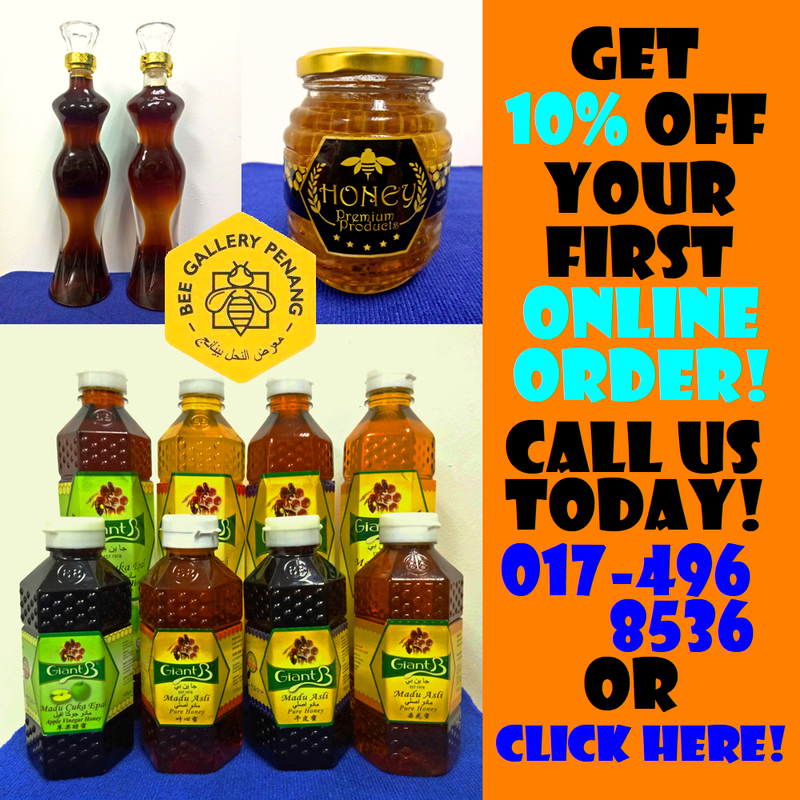 Other ingredients include kidney beans, attap chee (nipa palm fruit), grass jelly, agar-agar (algae jelly), nata de coco and creamed corn. 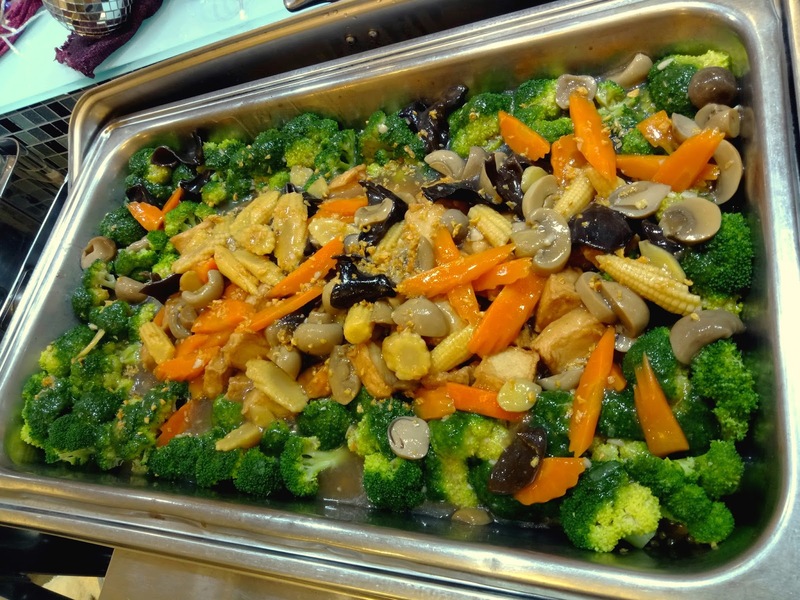 Tau Fo Fah (豆腐花) is seldom served in buffets because the preparation process is difficult to master. However, Kopi Tiam pulls off with flying colors. 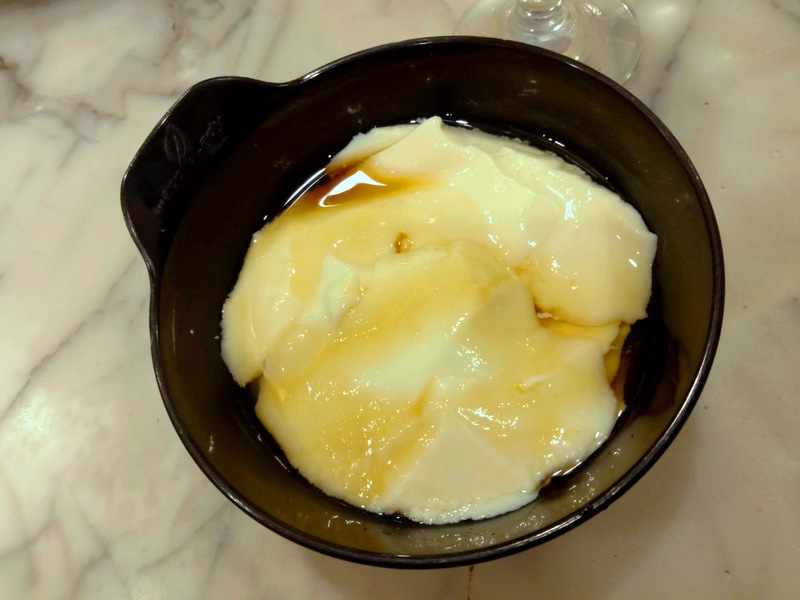 The soy-based pudding is flavored with palm sugar syrup which is not excessively sweet. This soft dessert is served hot. 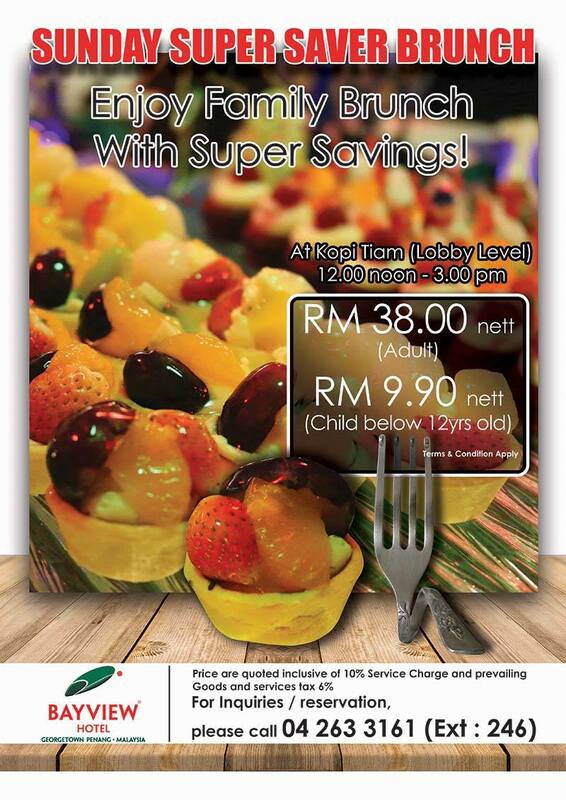 Bayview Hotel's Sunday Super Saver Brunch is served from 12:00pm to 2:30pm every Sunday. The price is RM38.00 net per adult and RM9.90 net per child between 7 and 12 years old. Considering the quality and variety of dishes available, the buffet gives good value for money especially for families with children.